Thanks to advances in flat panel display technologies, prices are falling and performance is rising. As a result, flat displays are in the thick of things. To paraphrase the Duchess of Windsor, displays can never be too thin or too rich. Flat panel displays take up less room and consume less power than their cathode-ray-tube kin. However, in the past, flat panel displays were too expensive and their image quality too poor for many applications. Advances in technology have changed all that. “In 2002, we had flat panel displays at $29 billion revenue worldwide, and that’s growing to $62 billion by 2006,” said Barry Young, vice president of the Austin, Texas-based flat panel display market research and consulting firm DisplaySearch. Most flat panel displays today employ liquid crystal display (LCD) technology but other methods — notably organic LEDs (OLEDs), micromirrors and liquid crystal on silicon — offer some advantages and potential. Organic LEDs, for example, may allow displays that can be rolled up like a piece of paper. Liquid crystal on silicon could power headsets that give doctors a three-dimensional close-up during endoscopic surgery. Micromirrors can not only provide large-screen, high-definition digital color, but also might enable high-speed optical switching. But before such possibilities can become commercial reality, a few challenges must be met. Organic LEDs need to grow in size and solve some material lifetime and performance issues. Micromirrors need to cut costs, and liquid-crystal-on-silicon displays must take advantage of their relatively high pixel density. A look reveals each technology’s promises and pitfalls as well as how LCDs are fighting back. At present, there’s little for LCDs to battle. Analysts report that LCDs of various types capture more than $4 out of every $5 spent on flat panel displays worldwide. One implementation, the active-matrix LCD, accounts for 75 percent of the total market. In an active-matrix configuration, thin-film transistors, capacitors, resistors and other semiconductor elements sit beneath each and every pixel and actively switch it on and off. 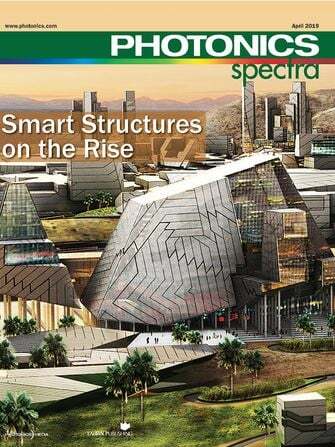 Stanford Resources is a San Jose, Calif.-based research firm specializing in the electronic-display industry. Kimberly Allen, director of technology and strategic research, noted that any flat panel display that measures more than 7 or 8 inches across is likely in the active-matrix LCD category. “LCDs are essentially unchallenged in the areas of notebooks and monitors and small flat panel TVs, those less than 30 inches in size,” she said. Many factors lie behind this LCD dominance, and these have an impact on the prospects for other flat panel display technologies. The first, and probably most important, element is ongoing cost reduction, which is driven by manufacturing innovations and economies of scale. Intertwined with this, but also distinct, are such secondary aspects as improvements in the thin-film transistors and the liquid crystal itself. The steady decline in the cost of a liquid crystal display has been due to a steady gain in manufacturing know-how. Display manufacturers speak of generations and mother glass. In fabricating an active-matrix display, manufacturers deposit transistors on a slab of mother glass, cut it up into pieces, and attach connections to the outside world. This is then capped with another piece of glass held off by spacers. The edges are sealed and the gap filled with liquid crystal material. A backlight is often added as a light source. Most of the initial fabrication is done in cleanrooms comparable in size, cost and capability to leading-edge semiconductor facilities. In the case of flat panel display manufacturing, however, the state-of-the-art substrate size is quite a bit bigger than the 300-mm-diameter silicon wafers found in the most advanced semiconductor factories. Japan’s Sharp Corp., for example, has announced a seventh-generation fab that uses an 1800 x 1500-mm piece of glass. “Put Shaquille O’Neal on the diagonal, and there’s three inches of headroom. That’s how big it is,” said Joel Pollack, vice president of the display business unit for Camas Sharp Microelectronics of the Americas in Camas, Wash. Besides better manufacturing know-how, Sharp and other vendors, most of which are located in Japan or Taiwan, are working on thin-film transistor innovations. Because these transistors are deposited on glass, they must be fabricated at a lower temperature and using a different base material than that employed to make standard semiconductors. Traditionally, this has meant a performance hit and the necessity of using off-glass electronics. To combat this, Sharp has developed what it calls continuous-grain silicon, which reportedly boosts the switching speed of the transistors on the glass. Because it allows more of the display electronics to be built on the glass itself, this could lead to higher-performance, less expensive and more reliable displays. Putting more electronics on the glass also reduces the number of connections that need to be made to the outside world. This eliminates a bottleneck, allowing greater pixel density and higher information content on smaller displays. Sharp is also pursuing transflective LCDs. Besides a backlight, such displays use shiny thin-film-transistor regions to create a reflective display. Careful engineering of the LCD cell gap allows the total amount of liquid crystal material traversed to be the same in either transmissive or reflective modes. In the former, light transits the cell once, while in the latter, it crosses it twice. According to Pollack, this optical engineering allows fabrication without compromises to contrast or transmissivity. He added that the display looks the same despite moving from bright sunshine to full darkness. While LCDs dominate the middle of the display spectrum, new contenders are nibbling at both edges. Organic LEDs are targeting small screens, such as those found in cameras, cell phones and cell phone subdisplays. The latter are used to present caller ID and other information. Organic LEDs break down into several competing variants. Eastman Kodak Co. of Rochester, N.Y., has a small-molecule version, Cambridge Display Technology Ltd. of Cambridge, UK, a polymeric version, and Universal Display Corp. of Ewing, N.J., a phosphorescence-based one. What an organic LED offers over an LCD is the ability to directly generate light. This capability eliminates the need for a backlight and the associated extra thickness, weight and power drain, which can be particularly important in cell phone and other mobile applications. Organic LEDs also have wider viewing angles, lower overall power consumption, faster image response, higher contrast, greater immunity to temperature extremes and, according to adherents, eventually lower manufacturing costs than LCDs. Despite these advantages, proponents of this technology are not complacent. Kodak has the largest commercial organic LED display presence. Full-color active-matrix displays, which are based on the company’s technology, have just appeared in one of its digital cameras (Figure 1). According to d’Almeida, this type of display enhances the consumer experience by providing a large viewing angle and good contrast. That, in turn, enables a more faithful reproduction of the image actually captured by the camera. Figure 1. 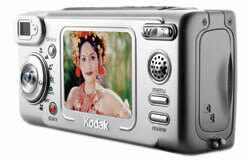 Eastman Kodak recently employed its active-matrix organic LED technology in one of its digital cameras. All organic LEDs consist of a stack of thin organic layers sandwiched between electrodes (Figure 2). When an appropriate voltage — typically a few volts — is applied, both positive and negative charges are injected into the light-emitting layer within the organic LED cell. These charges recombine in the emissive layer to produce light. That process can be improved by tailoring the materials used and by doping the emissive layer with a small amount of highly fluorescent or phosphorescent molecules. Figure 2. 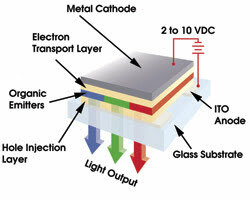 Organic LEDs are built using a stack of thin organic layers sandwiched between electrodes. Courtesy of Eastman Kodak. On the other hand, the polymeric method can literally coat a surface employing low-cost, solution-based processes such as spin coating and ink-jet printing, taking advantage of these other methods to manufacture displays (Figures 3 and 4). “That’s one of the very strong attractions of this technology, the idea of actually printing displays or lighting devices,” commented Stewart Hough, vice president of business development at Cambridge Display Technology. Figure 3. Displays, such as this one from Cambridge Display Technology, are made using light-emitting polymer technology. Today’s organic LEDs are, of course, less than perfect. Manufacturers of these devices have started small because of the production challenges associated with scaling up the displays. It’s easier to build a cell phone screen than one that goes in a laptop or television. Vendors are investing heavily in the hope that their products will follow the same upward trend in size that LCDs took. Other problems with these devices include material lifetime and finding the right emitters, particularly in the blue. A few years ago, there was some skepticism that any organic LED could last long enough to be useful in even a short-lived consumer product. That has been answered by demonstrations of tens of thousands of hours of life by several materials. A more subtle form of the same problem is the different aging of red, green and blue emitters. Today, vendors compensate by carefully balancing the size of the different subpixel components. Figure 4. The structure of a polymeric organic LED includes a light-emitting polymer layer. Courtesy of Cambridge Display Technology. These problems are being attacked through ongoing research and development at all of the companies involved. Investigators at Princeton University in New Jersey and the University of Southern California are associated with Universal Display. A few years ago they developed phosphorescent organic LEDs, which are said to be more efficient than their fluorescent counterparts. The technique is being developed and has already borne some fruit. Mahon added that her company has been able to create well-saturated reds and greens that are highly efficient and have greater than 10,000 hours of operational life. For now, this has been done only with the small molecule approach, but she said that the company hopes eventually to do the same in a solution-processible, and thus printable, formulation. Another challenge lies in creating a long-life blue with good saturation and efficiency characteristics. It’s a problem that faces the entire organic LED industry to some degree, no matter the technology, Mahon said. Despite these issues, the market for these displays is expected to expand substantially. Analysts peg the annual growth rate at 65 percent per year over the next five years or so. As organic LEDs strive to penetrate the small end of the LCD domain, the other extreme is facing its own contenders. Standard direct-view LCDs stop at sizes of 40 inches or so. Large-screen LCD televisions of 50-plus inches have been demonstrated, but poor mother-glass yields make such devices more proof of principle than anything else. So for very large screens, there are a few other flat — or, perhaps more accurately, thin — display technologies currently being employed. Plasma displays are one such. These are truly flat, emissive, bright and colorful. They’ve also been around for years. However, the consensus is that plasma displays are too expensive for widespread consumer acceptance and possibly of too low a quality compared with other approaches. An alternative to plasma displays is a whole class of what might be called thin displays. 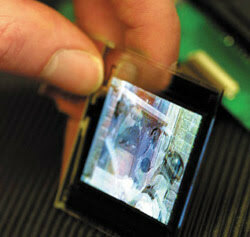 These use optics to magnify a small microdisplay into one that fills an entire screen and so are not flat. Optical constraints force them to have a ratio of screen size-to-cabinet depth. “About a quarter to a fifth of the screen size is about how deep the cabinet will initially be,” said Sandeep Gupta, CEO of MicroDisplay Corp. of San Pablo, Calif. Future improvements and optical engineering innovations, he said, should lead to even smaller ratios of cabinet thickness-to-screen size. MicroDisplay, along with such companies as Three-Five Systems Inc. of Tempe, Ariz., is pushing liquid crystal on silicon (Figure 5). In this approach, silicon is used for the back plane, so all imaging is dependent on reflected light. Figure 5. This image chip was built using liquid-crystal-on-silicon technology. Using projection optics, it will be enlarged to fit a 50-in. TV screen. Courtesy of MicroDisplay Corp.
Another consequence is that the pixel density can be quite high. Pixel sizes of 12 μm are routine, and it’s possible to get devices with pixels as small as 8 μm. What’s more, the gap between pixels is measured in fractions of a micron. Three-Five Systems’ vice president and chief technology officer Bob Melcher noted that, as a result, the image is smooth. There is no screen-door effect that is found in some transmissive display technologies where dark spaces between the pixels are visible, much like the wire in a screen. On the other hand, the tight packing and tiny pixel size can lead to imaging chips that are almost too small for the other system components. “As you make the device smaller, they can be made at a lower cost without sacrificing performance. However, the smaller they are, the more difficult they become to illuminate efficiently,” said Melcher. Today, liquid-crystal-on-silicon microdisplays from all vendors are a small fraction of the total sold. That may change in the future, but for now, a different microdisplay technology, called digital light processing, or DSP, from Texas Instruments Inc. of Dallas is a significant and rapidly growing part of the overall market. According to analysts, this company has captured 25 percent of the large-screen-projection market, a category that includes televisions and business gear. That figure will grow to 33 percent in the next three years. Digital light processing devices use reflection off miniature aluminized mirrors. On command, the mirrors tilt and send a spot of reflected light into and out of the optical path. This effectively creates a digital image. The latest generation of digital micromirrors measure 13.8 μm center to center. Ian McMurray, European marketing manager for Texas Instruments’ digital light processing products, said that this represented a nearly 20 percent reduction in mirror spacing from the devices introduced a few years ago. The company also has enhanced the contrast by coating the substructure of the mirrors with a light-absorbing material. Other improvements have been made to supporting circuitry to allow faster and more complex signal processing. Finally, the capabilities of the mirrors have undergone changes. “They feature a 12°, rather than a 10°, mirror-tilt angle. The effect of this is to increase brightness by, typically, up to 20 percent,” McMurray said. He added that the manufacturing process has recently transitioned to a larger wafer size and that the company has entered into agreements with another firm for manufacturing assistance. All of these moves are designed to help meet what it sees as rapidly rising demand. However, for all the flat panel display advances and the resulting rapid growth, it’s important to keep in mind that the cathode-ray tube is not dead. IDC, a market research firm based in Framingham, Mass., has predicted that in 2003 flat panel displays will, for the first time, pass the venerable tube in terms of computer monitor revenue. Next year, IDC predicts, the displays will pass tubes in terms of units sold. The same can’t be said for televisions. Plain vanilla direct-view cathode-ray tubes make up about 95 percent of the units shipped, according to Stanford Resources’ Allen. The reasons are the same as those behind the acceptance of any other display technology — and a reminder of what all flat panel displays have to strive for. As Allen observed, “In the TV world, what matters are what it looks like in the store and how much it costs. That’s how consumers buy TVs. The CRT is perfect — it looks great and it’s cheap. What’s not to like? Organic LEDs promise flexibility, but that potential is hard to realize. The problem lies in the materials that make up these devices. They’re flexible in that they can bend and move, but they’re inflexible in their intolerance of water and oxygen, which can damage them, leading to black or inactive spots on the screen. As a result, today’s organic LED display is sealed by two pieces of glass sandwiched with a desiccant interlayer. It’s this glass that makes the display as unyielding as the one found on every laptop. For true flexibility, the glass must be eliminated, which is what Vitex Systems Inc. of San Jose, Calif., would like to do. The company has a vacuum polymer deposition process that puts down a 3-μm coating of alternating polymers and ceramics. The result, according to company officials, is a thin, flexible film that offers the moisture protection of a piece of glass and that can be put down right on top of an organic LED. “When you’re finished, you can come right out into atmosphere, and it’s protected,” said John McMahon, Vitex’s vice president of sales and marketing. For small displays, this means that a single piece of glass is sufficient. That effectively cuts the thickness of the display in half and trims the weight by a like amount. There are also cost savings, according to McMahon. All of these are important considerations in cell phones and in other mobile applications. But the same technique, he noted, can be extended even further. The coating can be done on a piece of plastic, leading to what Vitex calls flexible glass. Depositing an organic LED and the associated electronics on such plastic and then encapsulating it would lead to a truly flexible display. 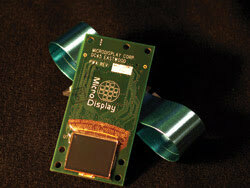 Microdisplays can do more — or actually less — than make a wall-size image. They also can make one considerably smaller. But, thanks to the magic of optics, such an image can appear to be a full-size one floating in space. These are so-called near-to-eye applications because they require the user to peer through some sort of goggles or glasses. This approach has a number of possible applications. One is as a mini-beamer, a small device that would project a cell phone or personal digital assistant display onto a piece of paper. In this way, people could wirelessly surf the Web without having to work through a tiny screen. 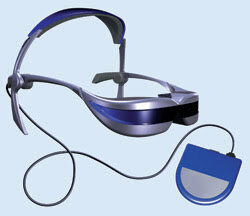 Another possible near-to-eye application is in ultraportable DVD players. Other uses of the technology involve the military or biomedical fields. A near-to-eye liquid-crystal-on-silicon microdisplay, such as the one in this conceptual drawing, allows the viewer to see a full-size image in a portable product. Courtesy of Three-Five Systems. “You can build a 3-D stereo binocular headset so that a surgeon actually gets a feel for depth during endoscopic surgery. That’s not possible with a CRT or a standard direct view display,” said Three-Five Systems’ vice president and chief technology officer Bob Melcher. Such applications, he readily admitted, have not existed before. So the technology is developing along with the markets. He also acknowledged that many of the initial markets will be small but could provide high value to, and command a high premium from, potential customers. While any microdisplay manufacturer could pursue such markets, many have chosen not to. This is true even for those with liquid-crystal-on-silicon-based products. MicroDisplay, for example, specifically does not target near-to-eye use, instead choosing to concentrate on big-screen televisions and home entertainment systems — applications with existing and large markets.